Virginia Wildlife is your ticket to learning more about Virginia’s spectacular wildlife, fisheries, and breathtaking habitats. 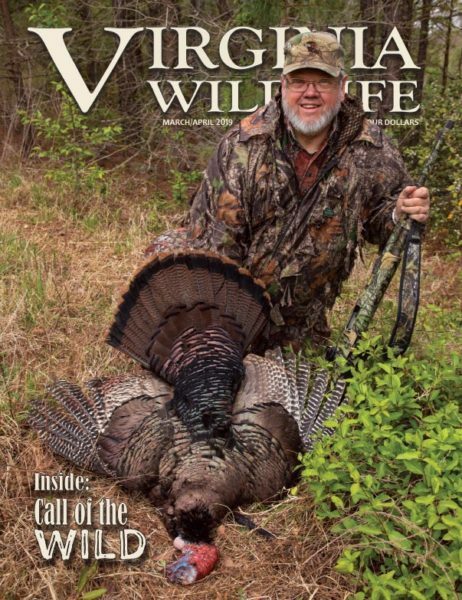 Whether you hunt, fish, boat, camp, or take in the wildlife from your easy chair, Virginia Wildlife offers you stories and insight on the natural world, supplied by the state’s leading wildlife and outdoor experts. Cover photo by Lynda Richard/DGIF. Executive Director Bob Duncan poses with his spring gobbler. After a 45 year career in wildlife, our Executive Director Bob Duncan writes a memorable goodbye. One of the most adaptable animals in North America, the coyote plays a necessary role in Virginia and is here to stay. Landowners are partnering with organizations and citizen scientists to create landscapes that promote biodiversity. A look at five of the numerous rivers and streams designated as “special regulation” which offer high quality trout fisheries for all. In the chill of early spring, spotted salamanders play out a rarely observed, age-old drama. Teaming with Ducks Unlimited, DGIF works to improve wildlife habitat on the Princess Anne and Hog Island WMAs. Want to try spring gobbler hunting? Check out this article on how to get started. Enter the Virginia Wildlife Photography Showcase! 18 Issues (3 Years) at $29.95 — Best Deal! Subscribe while you purchase or renew your hunting and fishing licenses!